In December, 2014, a new kraft paper processing line was successfully commissioning at the paper mill in India. The target of the kraft manufacturer was to maintain advanced and high efficient paper manufacturing system that is equipped with Leizhan state-of-the-art technology. Leizhan delivered the whole testliner paper making line which contains stock preparation and kraft paper production machinery to India paper mill. Kraft paper machinery is designed for a paper width of 3,200 mm and in the future will produce 120t/d kraft paper and testliner from waste paper at a working speed of 250 m/min. Leizhan delivered the complete process line to India: from paper pulping system, the kraft paper making machinery, accessory equipment and spare parts all the way to PLC control system and engineering. Apart from that, training, installing and commissioning services also can be supplied by Leizhan for paper plant. 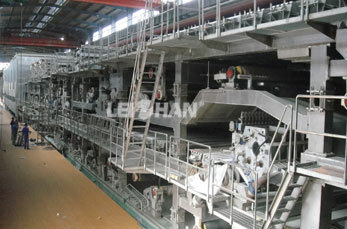 With 34 years of experience in the paper and pulp industry, Leizhan is committed to the improvement and innovation of paper machinery and paper production solutions to optimize the paper manufacturing process, and develop energy saving and resource saving paper manufacturing machine to reduce energy consumption, fiber loss and operating cost.